Protective ceramic coatings applied by experienced and professional applicators. Ceramic Coatings have been in development for over 15 years, posting improvements in temperature resistance, film thickness, lubrication, thermal barriers / thermal dispersants, electrical conductivity, toxicity, and chemical/corrosive resistance. US Ceramic Coatings. believes that the ceramic coatings technology can increase the value, usefulness, and durability of its own product line and its customers' existing accessories, parts, and products. Since 2004, US Ceramic Coatings have been applying cermic coatings to piping systems, tanks, pump casing and impellers, valve bodies and internal parts, fan bodies and blades, locomotive and stationary diesel/gas engines, rail cars, offshore production platforms, ships, refineries, chemical plants, power generation facilities, etc. US Ceramic Coatings is very proud of the work we do and are excited to share some of the work we have done in our US Ceramic Coatings Photo Gallery. Please contact US Ceramic Coatings if you would like more information about any of these coatings. "This time (the coating) lasted 1 year and 3 months, not 2 years like the first, but still way better than the 6 months we were use to getting, uncoated. ... I'm also impressed how fast the pump works coated vs uncoated. It is a night and day difference!!" 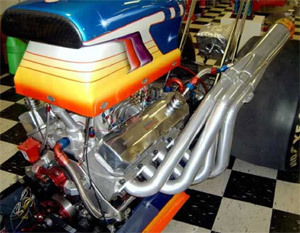 "I had the exhaust system coated inside and out with a black flexible ceramic coating used on race cars. I'll swear my CHT's are 15 to 20 degrees coolerand they have a nice appearance. They contain the heat and get it out the pipes better!" "An old Caddy cross over pipe recorded between 519 - 560°C surface temp at idle. After coating a new pipe with Team Synergy Coatings (TCB-107), they recorded only 375 - 400°C at idle! That's a 185 °C temperature drop! We wouldn't have believed it if my guys and me hadn't seen it for ourselves!"